You will shop on the Klutz site to assemble an order, but you will not place your order with them. Rather, you will email the order to ClassWish for us to place and pay for. Please follow these easy directions. Sign in as a guest or with your account, as you prefer. 3.Follow the Shopping Process Below. Delivery Address: You must provide the school address as your shipping address. We cannot ship to your home. Email: Please enter the same email address as you used to register with ClassWish.org. Phone: Provide the school phone # in case of delivery problem. You will not check out from this site. You are only using the cart to assemble an order that you will email Classwish. Now, submit your request to ClassWish so we can place the order for you. Download this Request Form. Please use this form for your request for items from only a single vendor. If you want to submit requests for items from multiple vendors, please submit separate forms for each. Fill it in as instructed. The information you provide should match what appears in the shopping cart. 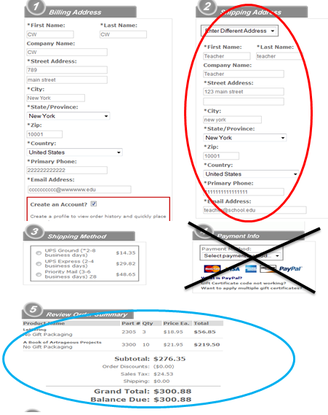 Copy and Paste the entire Shopping Cart (circled in blue in the illustration to the right) into that Request Form. Be sure it includes all the items, the freight, tax and total. Disregard the Payment section (the black X in the illustration to the right). If the total amount of your Request exceeds the amount in your ClassWish account, you can visit your ClassWish page and make a tax-deductible donation to cover the shortfall. See if your spouse's employer will match that donation. Please review the email to make sure your order is correct and that you did not skip any of the steps. Please add this subject line: Teacher request for Klutz. Then just send that email to Request AT ClassWish.org (be sure to change the “AT” to an @ sign. Like many websites, we display it this way to reduce the risk of robots grabbing the email address for spamming. Be sure to send the email to us from the email address you used to register with ClassWish, as that helps ensure the security of your account. If your order exceeds the amount in your ClassWish Wish List account, please visit ClassWish.org to make a tax-deductible contribution to your own wish list right after you place your request. We will check to make sure you have enough funds in your ClassWish account. If so, we will deduct the order amount from your ClassWish account. We will submit the order to Klutz and pay for it. Klutz will ship the materials to you at your school. You will tell other teachers so they can get support, too. In fact, why not do that, right now?